For more than a century, Saint Thérèse of Lisieux, also known as “The Little Flower,” has captivated countless minds and hearts. Her simple and pure heart burned with a deep love for our Lord, and that love overflowed into the lives of many. She daily inspired those who knew her, and she continues to inspire those who read her story. Marie Françoise-Thérèse Martin was born on January 2, 1873 in Rue Saint-Blaise, Alençon, France to Marie-Azélie Guérin (Zélie), and Louis Martin, a jeweler and watchmaker. Her mother, who often called Thérèse her “little angel,” died from breast cancer only a few months before Thérèse’s fifth birthday. But those early years with her mother had such an impact upon Thérèse that, in many ways, her mother remained with her, in her heart and mind, throughout her life. The love that mother and daughter shared was eternal. Her father, Louis Martin, who called Thérèse his “little queen,” daily manifested his profound love for her, and she looked up to him as her “king.” As a child, Thérèse would spend hours with her father as he worked in the garden, desiring to be near him as often as she could. She would regularly accompany him on daily walks that always included a visit to the Blessed Sacrament at the nearby convent in Lisieux. She loved being in his presence and found the satisfaction of the love of God in his fatherly embrace. At age sixty-six, Louis suffered from two strokes, resulting in paralysis. He spent the next three years in a hospital and the final two years of his life at home in the care of his family. His daughters Céline and Léonie were his primary caregivers at home until June 24, 1893, when Léonie entered the Visitation Convent in Caen at a second attempt at religious life. The last year of his life, Céline faithfully cared for their father with the help of their uncle, a maid and a male assistant until his death on July 29, 1894. Marie, who became a Carmelite in Lisieux, taking the name Sister Marie of the Sacred Heart. Pauline, who became Mother Agnes of Jesus in the Lisieux Carmel. Léonie, who became Sister Françoise-Thérèse, Visitandine at Caen. Her life of saintly virtue is currently under study for the purpose of possible future canonization. Céline, who also became a Carmelite in Lisieux, taking the name Sister Geneviève of the Holy Face. The relationship that Thérèse had with her sisters was both typical and unique. The girls played together and sometimes fought with one another. Yet, the depth of their love and affection for one another transfigured what was otherwise a normal sibling relationship. Thérèse adored her sisters and loved being with them, and this love was reciprocal. Thérèse’s entire family shared tender, affectionate, and unwavering love for one another. Their home was a true “school of love” and the lessons of love were learned and lived in their home each and every day. In many ways, Thérèse learned about the love of God first and foremost through the love she experienced within her family. Just before her fifteenth birthday, after overcoming many obstacles, Thérèse received permission from the Bishop of Bayeux to be received into the Carmelite convent. She formally entered as a postulant on April 9, 1888, at the age of fifteen. She embraced religious life and lived it with fervor and devotion, making her temporary vows on January 10, 1889 and her final vows on September 24, 1890. For the next seven years, Sister Thérèse lived the hidden and holy life of a Carmelite nun. Sister Thérèse began to write her autobiography when she was twenty-one years old, just three years before she was to die, under obedience to her sister Pauline who had recently been elected as Mother Superior, Mother Agnes of Jesus. This autobiography, The Story of a Soul, captures the beauty and profundity of her family life, offers beautiful insights into her vocation as a Carmelite nun, and reveals how devoted she was to Jesus, longing to be with Him forever in Heaven, even from the earliest moments of her childhood. The first manuscript that makes up the Story of a Soul includes Sister Thérèse’s childhood memories as well as her first years as a religious sister. At age twenty-three, Sister Thérèse contracted tuberculosis and spent more than a year suffering greatly. It was during this time that Sister Thérèse added two more manuscripts to her autobiography. One was written for her sister Marie, Sister Marie of the Sacred Heart, who desired to hear more about Sister Thérèse’s spirituality (covered in Chapter 10 of this book). The final manuscript detailed her life as a religious sister and was written under obedience to Mother Marie de Gonzague at the request of Sister Agnes of Jesus (covered in Chapter 9 of this book). This final manuscript was written during the last year of her life after it was discovered she had contracted tuberculosis. She never finished this manuscript as a result of her diminishing health, but her sister, Sister Agnes of Jesus, kept a detailed notebook of Sister Thérèse’s last months, which has been printed in a separate book called Her Last Conversations. Also available in print are the Letters of Sister Thérèse of Lisieux, much of which was first published under the title of General Correspondence. Lastly, Sister Thérèse was an avid writer of poetry, prayers and plays, many of which are published in various formats. As mentioned, Thérèse’s mother, Zélie, died when Thérèse was only four years old. Her father, Louis, died when Sister Thérèse was twenty-one years old, just three years before Sister Thérèse’s own death. Pope Francis canonized both Louis and his wife Zélie, making them the first husband and wife to be canonized together and the first canonized mother and father of an already canonized child. Though the cause of beatification for each of Saint Thérèse’s other sisters has not been opened, there is little doubt that these sisters were true servants of God who were filled with deep holiness. They were a saintly family. Sister Marie of the Sacred Heart died in 1905 of tuberculosis. Mother Agnes of Jesus (Pauline) died on July 28, 1951, and the final Martin sister, Sister Geneviève of the Holy Face (Céline), died February 25, 1959. This book offers 99 short lessons, reflections and prayers from the life of Saint Thérèse. The lessons are based upon Thérèse’s own words as she shared her faith and her heart in the pages of the three manuscripts of her autobiography: Story of a Soul. Each subsequent reflection attempts to capture one of her countless virtues so as to savor the “fragrance” of this precious little flower of God and to apply it to the reader’s daily life. The prayer to conclude each lesson is not written only to be read, it is written to be prayed. You may find it helpful to pray that prayer slowly and meditatively at the end of each lesson and perhaps even return to that prayer at the end of each day, returning especially to the prayers that are most pertinent to your life. It may be beneficial to use this book as a daily reflection book, reading one lesson each day. Doing so will allow you to ponder one lesson from her saintly life at a time, so as to absorb the sweetness of her love and the depth of her life. However, you might find it just as beneficial to read several lessons at a time. 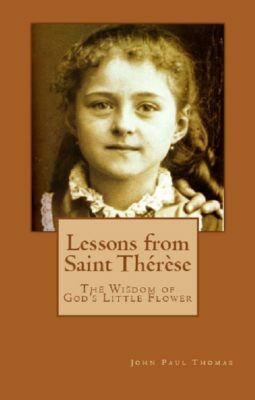 Additionally, this book is not intended to be a “onetime read.” Rather, the lessons we learn from Saint Thérèse’s life are worth absorbing throughout life. Therefore, the reflection and prayer after each lesson make this book a helpful source of daily self-examination and prayer throughout life. For those who especially feel inspired by the life of Saint Thérèse, this book will be helpful to return to over and over. You who are parents might also find the lessons of St. Thérèse of benefit in the formation of your children. Telling Little Thérèse’s stories will inspire and challenge your children as they grow and mature in their own life of faith.